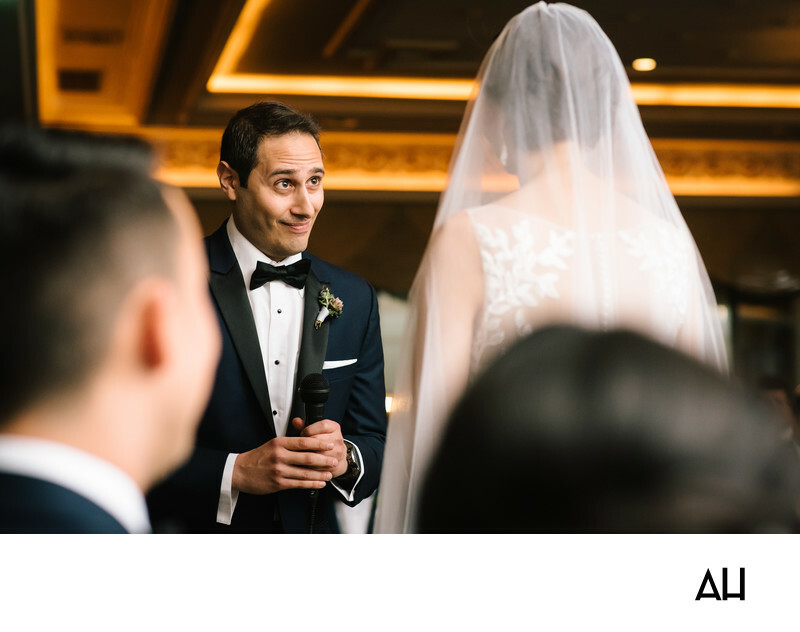 A New York Documentary Wedding Photographer has the ability to experience a wide variety of venues within the city. Marina Del Rey is one venue that is always great to work at as a New York Documentary Wedding Photographer. The Marina Del Rey venue is a space that takes wedding attendees out of the city and allows them to feel that they have been transported to an old, elegant European villa on the water. All it takes to bring them back to the present is a glance out of the expansive windows, spread throughout the venue. These windows look out on the New York City skyline in all its glitter and splendor, a breathtaking view for any wedding. This particular Marina Del Rey wedding had both the marriage ceremony and the reception within spaces offered by the venue. This picture shows the bride and groom, standing before their family and friends, promising to love and cherish one another for all eternity. In this moment, the groom is speaking into a microphone, speaking his personally crafted vows to his soon-be-wife. While the bride’s face is turned away from the camera, it is still evident that she is grinning from ear to ear as she takes in the groom’s words. He speaks of how he met when he first saw her, the woman who would someday be his bride, and then moves on to detail all the reasons why she is the only person in the world he wants to spend every day with, for the rest of his life. The groom smiles back at the bride, his expression earnest, as he bares his heart on this very special day.